Toxic leadership means abuse of the people one is supposed to lead. Toxic leaders demean people, verbally or physically assault others, and create hostile work environments. Abusive behavior often gets short-term results, as good professionals seek to be supportive. Over time, however, your talent will vote with their feet out of your organization and over to a competitor. A Michigan State University study estimates that a toxic environment costs $14,000 per affected employee in lost productivity. Tolerating toxic leadership is a losing proposition. Here are 6 causes and how to fight them. The first problem is YOU. “Know thyself,” counseled the famed Oracle of Delphi — cautioning seekers of wisdom to guard against our innate tendency toward self-deception. Lack of self-awareness can lead to ignorance about our own personal tendencies or naïve beliefs that we can transform ourselves into someone we are not. Some people, for instance are introverts, others are extroverts. Both can be great leaders (George Washington, for instance, was an introvert). The “extrovert ideal” as Susan Cain, author of Quiet: The power of introverts in a world that can’t stop talking, calls-it, has created a phony belief that only extroverts can lead. This presumption has led people to under-value introverts and to create work-environments that undermine their ability to contribute. Self-deception can lead us to rationalize data points about ourselves that should serve as warning signs. One organization that had a reputation for high levels of toxicity consistently rationalized alarmingly low scores on climate surveys with the odd justification that “we have had a lot of turnover.” They made no effort to better understand or address the feedback. How well do you know yourself? Do you have ways to gain and interpret honest feedback? How do you respond? Burying criticism or never addressing employee-feedback creates cynicism and a lack of faith in your leadership. 2. Mistaking diversity for balance. You need both. Diverse leader teams can offer perspectives and insights that help organizations avoid blind-spots and connect with a wider range of customers. They can also provide clear examples that people of all types are valued. Diversity is not the same as balance — particularly intellectual balance. A diverse leader team of detail-oriented people, for example, risks status quo bias and an under-emphasis on innovation. A diverse leader team of visionaries, like Google in the late 1990s, is likely to generate exciting new ideas but could have problems putting them into practice. A failure to maintain intellectual balance can lead to toxic behavior as detail-oriented leader-teams find themselves unable to respond adequately to pressures to innovate. Vision-oriented leader teams may bleed cash and talent as poor business decisions cascade into losses and strife. President Abraham Lincoln famously emphasized balance in his cabinet — this balance kept him grounded in practical realities while alert to innovative ways to advance his policy and strategy. Over time, ending slavery co-existed alongside restoring the Union as a central war aim. Lincoln advanced the policy of abolition at exactly the right pace and time — keeping the border-states on side and preventing foreign powers from intervening on the side of the Confederacy in the Civil War. Does your leader team have diversity AND balance? 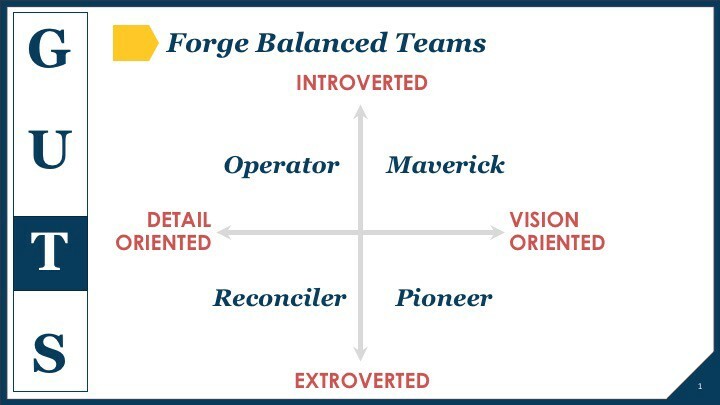 Leaders tend to fall into one of four broad types: Defenders, Reconcilers, Pioneers, and Mavericks. These categories result from intersecting personality type (introvert — extrovert) with tendencies toward vision or details. Defenders are detail-oriented introverts. They are superb at developing systems, enforcing rules, holding people accountable, and conducting detailed research and analysis of tough, complex issues. They can have a strong status-quo bias. Example: George Washington. Reconcilers are detail-oriented extroverts. They tend to excel at building teams, developing consensus on contentious topics, and managing delicate and complicated processes. They tend to be less comfortable with complexity and uncertainty. Example: Abraham Lincoln. Mavericks are introverted visionaries. They enjoy thinking though complex issues and coming up with big ideas to address chronic and wicked problems. They drive people to achieve the impossible. They can come across as aloof and insensitive. Example: Google CEO Larry Page. Pioneers are extroverted visionaries. They revel in rallying people behind new ideas and innovations. They question conventional wisdom, innovate relentlessly, break rules, and smash outmoded ways of thinking and doing business. They can be perceived as disruptive loose cannons. Example: General George Patton. Organizations need all four types to thrive in highly competitive environments. Lincoln’s balanced leader-team led the Union to success in the Civil War. Eisenhower’s balanced team did the same for the United States in World War II. Google thrived once its visionary leader-team was balanced by Eric Schmidt and Jon Rosenberg. Gaps greatly increase the risk of poor execution, internal strife, inadequate thought-leadership, and/or status quo bias. Any of these issues can lead to losing and toxic work environments. The power in this typology is its big-picture elegance — an organization can easily visualize its balance and look for key talent accordingly. More detailed assessments, like Myers-Briggs and others, bring important nuance that can help ensure workplace compatibility. Open Elevator has a super new approach to talent selection. Which type of leader are you? Find out by taking this 5-question test. 4. Right leader, wrong role. The leader-types outlined above have inherent tendencies on both sides of the strengths and limitations ledger. Knowing yourself and the people on your leader-team enables you to play to the strengths of each individual and the team. Conversely, failure to know yourself and your leader-team increases the risk of setting people up for failure. If you put a Defender into the role of a Pioneer, your quest for innovative new approaches may fall short of expectations. Conversely, putting a Pioneer in the role of a Defender, may lead to management systems and procedures that are less rigorous than your business needs. Maverick’s tend to be less able to build consensus on contentious issues. Reconcilers may spin their wheels in vain on wicked problems. A common mistake is to try to transform yourself or others into leader-types they are not. To be sure, all of us can and should make changes on the margins. Even more powerful is to recognize the inherent tendencies of the 4 leader-types and put people in positions to win. Sometimes you mistakenly hire a jerk. More often than not, you have set a good person up for failure and they turned toxic under the pressure and strain. The key is to identify and stop toxic behavior. Sadly, few leaders have active “Tox-i-meters” — ways to get honest feedback and examine how leaders get results. This error is compounded by the fact that by mid-career most jerks have perfected the “kiss up and abuse down” technique. Too many leaders love the flattery and choose not to look too hard at how things get done. A more prevalent cause of toxic behavior is setting people up for failure — putting the right leader in the wrong position. In 1942, the U.S. Army was defeated at the hands of the Germans at Kasserine Pass. General Eisenhower called on General George Patton to turn it around. And he did. He whipped the Army into shape and built an amazing armored fighting force that won. Patton was promoted and commanded U.S. forces in the invasion of Sicily. He hit strategic environment (see more on this below) and became toxic. General Eisenhower had a very active Tox-i-meter. He relieved Patton — the Army’s most aggressive commander — and denied him a combat command on D-Day. Eisenhower knew Patton was not a jerk. Rather, he had put Patton into an ill-suited position. Eisenhower’s genius was to figure out the exact right role for General Patton. As the commander of 3rd Army Patton became a legend. Failure to cultivate your leaders is entirely YOUR fault. Leaders tend to hit the wall when they enter a strategic environment — when they have high levels of autonomy and face highly competitive interactions. The latter results in extreme levels of uncertainty and complexity that leaders find difficult to handle. They soon discover that there is no safety-net — that success or failure relies on their decisions. Some leaders thus become risk-averse — afraid to make a decision in the face of ambiguous and contradictory information. Others create hyper-activity by over-reacting to every data point. A few become gamblers. The inability to cope with the strategic environment creates a losing cycle of errors and frustration. They lack the intellectual courage needed to win. Leaders rising to their levels of incompetence is nothing new. Global economic expansion and advances in information technology are accelerating this problem. As competitive actors become more interconnected and as uncontested space shrinks, leaders are finding themselves entering strategic environments more rapidly than in the past. They are hitting the wall at a higher rate and impact. Conventional leader development models are failing them. Climbing the corporate ladder and getting your MBA is no longer good enough. Stop chasing the latest tactics and techniques. Stop nerding-out over white-washed business cases. Focus on developing leaders and creating leadership environments that value intellectual courage. This is the best anti-dote for toxicity. It is the foundation that enables you to win. Take this 5 question leader personality test. Watch this short video on Intellectual Courage. Dr. Christopher D. Kolenda is the founder of the Strategic Leaders Academy, which helps leaders build the intellectual courage needed to thrive and win in a strategic environment.